Simplicity is the shortest path to a solution. We are thriving to introduce you our guide on handling unresolved invoices within a few clicks. Your server sends an API-request to our server so we can generate an invoice. We transfer 100 EUR to the BTC under the current rate and freeze this rate for 10 minutes. Your customer transfers funds on the BTC-address of this invoice. 1. Recalculate – the incoming transaction will be recalculated by the current rate. 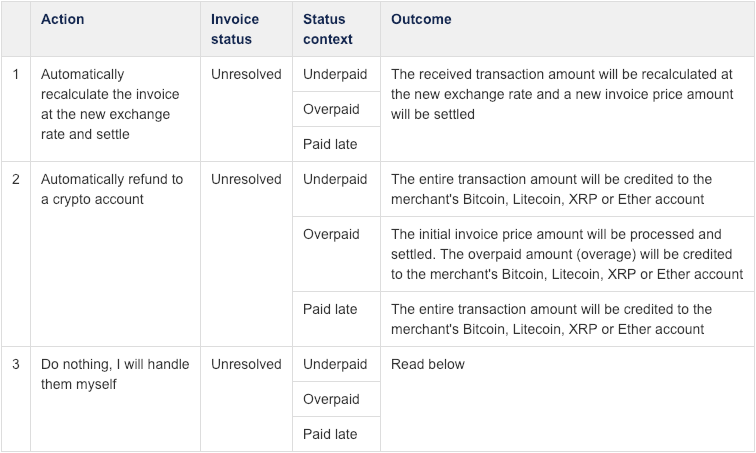 The invoice will change its status to Completed. 2. Refund – the incoming transaction will be refunded to the merchant’s cryptocurrency account or to external wallet address. The invoice will change its status to Refunded. How to receive the revenue share?